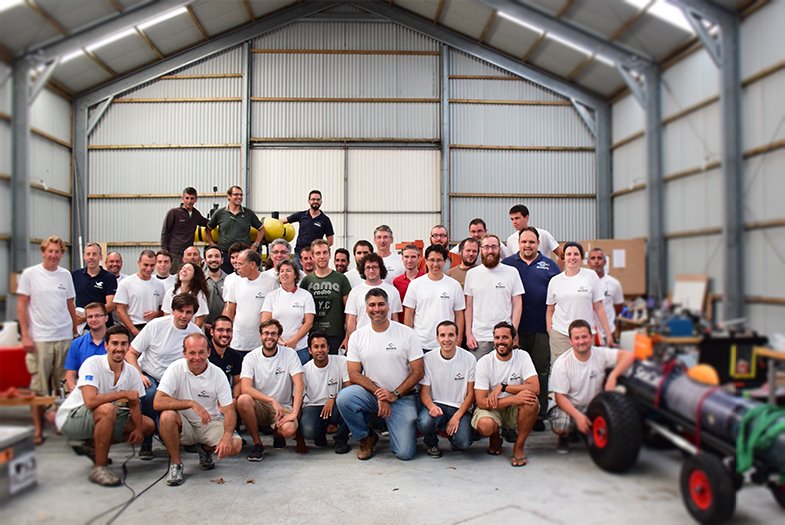 From 31 August to 11 September 2015, the Center of IMAR of the University of the Azores is hosting the final demonstration of a new type of robotics-based distributed sensor system, aimed at affording marine scientists and commercial operators a revolutionary tool for marine habitat mapping in complex underwater 3D environments. The trials form the ultimate project demonstration of the EC research project MORPH, entitled Marine Robotic System of Self-Organising, Logically Linked Physical Nodes. Launched in February 2012, the 4-year research project MORPH is funded by the European Union’s Seventh Framework Programme and Industry with a budget of 8,5 million Euros. The major goal of the project is to develop a distributed robotic underwater system carrying complementary sensors for complex underwater mapping missions. At the core of the innovative solution adopted is the concerted operation of a number of relatively simple, affordable vehicles, capable of cooperating seamlessly and behave as an ensemble, yielding a “MORPH Supra Vehicle”. Research engineers, marine biologists, and commercial partners have been working together to meet the formidable challenge of providing scientific and commercial end-users an advanced mapping system capable of accessing inhospitable areas and operating under scenarios that defy current technology; e.g., to perform underwater surveys over high-relief seafloor with complex 3D structures (canyons and rugged cliff areas) in the presence of reduced visibility and natural unforeseen obstacles. To prove the concept of a MORPH Supra Vehicle, the tests take place in the beautiful setting of “Baia de Porto Pim”, in Faial Island (Azores). The MORPH ensemble, or Supra Vehicle, is a fleet of 3 to 6 distinct vehicles, that will operate together to perform a video and sonar data survey to map an underwater cliff face and adjacent sea-bottom, dynamically adapting to the geometry of the survey area. The concept that makes the MORPH system unique is that its building blocks (a set of small robotic marine vehicles) operate in a cooperative manner, as if they were a single, powerful vehicle, capable of carrying advanced, complementary sensor suites, and reacting to environmental conditions in real time. The distributed nature of the mission responsibilities and resources allows for a more configurable, adaptable system which may perform survey faster and at a higher quality than traditional, mono-vehicle methods. During the ongoing trials (the last before the project ends), the MORPH system is being used to perform an underwater survey to acquire data and map black coral communities growing in an underwater cliff in Monte da Guia, Faial Island. The MORPH system explores an innovative concept which is expected to offer new solution to a number of problems in field applications such as: environmental monitoring, exploration of marine resources, archaeological surveys, harbour protection, monitoring of industrial infrastructures (offshore wind power installations, pipeline), and sea mine detection, to name a few. From an engineering standpoint, the problems that are being addressed and solved are at the forefront of underwater robotics technology, namely in what concerns cooperative mission programming, navigation, and control, as well as acoustic communications and vision-based habitat mapping. The MORPH team participating in the trials consists of 41 scientists from five countries and nine member organizations: ATLAS ELEKTRONIK (Germany, coordinator), IMAR (Institute of Marine Research, Portugal), Instituto Superior Tecnico (IST, Portugal), Jacobs University Bremen (Germany), Technische Universität Ilmenau (Germany), Ifremer (France), Universitat de Girona – Computer Vision and Robotics Research Institute (Spain), NATO STO Centre for Maritime Research and Experimentation (based in La Spezia, Italy), Consiglio Nazionale delle Ricerche – Istituto di Studi sui Sistemi Intelligenti per l’Automazione (CNR-ISSIA, Italy).